Abraham Lincoln was hopeful as inauguration day, March 4, drew near in the spring of 1865. The Confederacy was splintered if not shattered. The president, who had been besieged by critics for much of the war, was finally beginning to receive recognition for his leadership. But beneath the outward celebrations lay a different emotion. Many citizens were filled with anger as much as hope. Death and despair reached into nearly every home. An estimated 620,000 men died in the Civil War, almost equal to the number killed in all subsequent wars. Noted photographer Alexander Gardner was poised to record the event for posterity. The Second Inaugural Address would be the only occasion in which Lincoln was photographed delivering a speech. (He was assassinated 41 days later.) Police estimated between 30,000 and 40,000 people gathered at the east entrance of the Capitol. The correspondent for The Times of London estimated that "at least half the multitude were colored people." In the crowd, Lincoln recognized Frederick Douglass, the articulate African-American abolitionist and newspaper editor. The actor John Wilkes Booth, seething with hatred, stood up behind the right buttress. When Lincoln was introduced, the crowd exploded in expectation. He rose from his chair and stepped from underneath the shelter of the Capitol building and out past the magnificent Corinthian columns. At 56, he looked older than his years. The separation of church and state in the United States has never meant the separation of faith and politics. But how are they to be put together? Lincoln's Second Inaugural Address opens up windows into his own faith as he attempted to make sense of the tragedy of the Civil War. The precise nature of his faith is contested; we do not know enough to define or confine him. But the Second Inaugural can help us appreciate the profundity of Lincoln's biblical and theological insight as we wrestle with how to talk about faith and politics today. Lincoln's overarching strategy was to emphasize common actions and emotions. He acknowledged, "Both [sides in the war] read the same Bible and pray to the same God." The Bible had been quoted only once in the inaugural addresses of the previous 18 presidents (by John Quincy Adams). Lincoln's introduction of the Bible signaled his determination to think theologically as well as politically about the war. Many visitors to the White House reported that Lincoln read the Bible frequently. Noah Brooks, correspondent for the Sacramento Daily Union, wrote that Lincoln "fixed in his memory" whole chapters from the New Testament as well as from Isaiah and the Psalms. In the summer of 1864, Lincoln invited his Kentucky friend Joshua Speed to spend an evening with him. When Speed arrived, he found Lincoln reading the Bible. Speed said, "I am glad to see you profitably engaged." "Yes," replied Lincoln, "I am profitably engaged." "Well," Speed continued, "If you have recovered from your skepticism, I am sorry to say that I have not." Lincoln rose, placed his hand on Speed's shoulder, and said, "You are wrong, Speed. Take all of this book upon reason that you can and the balance on faith, and you will live and die a happier and better man." But Lincoln knew that the Bible and prayer could also be used almost as weapons to curry God's favor. On one side stood those who steadfastly believed that the Bible sanctioned slavery. On the other side were those who believed that the Bible encouraged abolition. Lincoln had become troubled by those who said, "God is on our side." In his Second Inaugural Address, he was inveighing against a tribal God who took the side of a section or party. God, he would explain, was inclusive both in judgment and reconciliation. Lincoln pointed out that it was "strange that any men should dare to ask a just God's assistance in wringing their bread from the sweat of other men's faces" (alluding to Genesis 3:19). How was it possible to read the Bible and come up with the practice of slavery? But he quickly balanced judgment with mercy by quoting the Sermon on the Mount: "Let us judge not that we be not judged" (Matt. 7:1, Luke 6:37). "Blessed are those," Jesus said, who do not follow the way of the world—in this case, judgment—but the new way of grace and mercy. Lincoln rejected a legalistic attitude and instead appealed to Jesus" ethic of humility and compassion. "The Almighty has His own purposes." With these words, Lincoln brought God to the center of his address. Generals might think they were managing the war, but human agency would not decide its outcome. In quick strokes, Lincoln described God's actions: "He now wills to remove … He gives to both North and South, this terrible war … Yet, if God wills that it continue …"
In Lincoln's own day and ever since, people have questioned how a president who never joined a church could use such language about God. Some have argued that Lincoln adapted his words to the language of his audience. Others point out that religious values were a part of his heritage. Finally, some claim that Lincoln excluded beliefs or language that would have put off his audience—such as enlightenment ideas about God. None of these proposals is adequate because none takes into account the evolution of Lincoln's thinking during the turbulent years of the Civil War. The will of God prevails. In great contests each party claims to act in accordance with the will of God. Both may be, and one must be wrong. God cannot be for, and against the same thing at the same time. In the present civil war it is quite possible that God's purpose is something different from the purpose of either party—and yet the human instrumentalities, working just as they do, are of the best adaptation to effect His purpose. I am almost ready to say this is probably true—that God wills this contest, and wills that it shall not end. By his mere quiet power, on the minds of the now contestants, He could have either saved or destroyed the Union without a human contest. Yet the contest began. And having begun He could give the final victory to either side any day. Yet the contest proceeds. One of Lincoln's private secretaries found this musing after the president's death and gave it the title "Meditation on the Divine Will." This private meditation anticipated the affirmations of God's purposes at the core of the Second Inaugural Address. Lincoln, convinced of God's activity, did not speak about God in the language of triumphalism. He was always suspicious of visiting church delegations or ministers who knew exactly when, where, and how God was on their side. Lincoln, who did not wear his faith on his sleeve, never spoke glibly about God. In both his hometown of Springfield and later in Washington D.C., Lincoln was drawn to two Presbyterian churches. In Washington, Lincoln's participation at the New York Avenue Presbyterian Church coincided with his deepening struggles to understand the meaning of God's activity in the maelstrom of war. The pastor at New York Avenue was Phineas Densmore Gurley, one of the best models of Old School Presbyterian preaching. A handsome man of large frame and voice, he graduated first in his class in 1840 from Princeton Theological Seminary, where he was a student of Charles Hodge. Central to this American Reformed tradition was providence—the belief that a loving God acts directly in history. In defense of providence, Hodge and his students were prepared to combat deviations from historic Christianity. Many modern biographers have wrongly interpreted Lincoln's religious thought as fatalism—the belief that all events take place in accordance with unvarying laws of causation. Historians have too often equated fatalism with providence. But 19th-century writers would not have made that judgment. In 1859, Episcopal minister Francis Wharton wrote A Treatise on Theism and the Modern Skeptical Theories in which he characterized fatalism "as a distinct scheme of unbelief" because it failed to recognize the personality and action of a loving God. In 1862, Lincoln's 11-year-old son Willie died of typhoid fever. Pastor Gurley presided at a funeral service for Willie at the White House. Gurley centered his sermon on what was finally "very comforting," namely "to get a clear and a scriptural view of the providence of God." Gurley, in the spirit of Hodge, acknowledged the perplexity of providence, calling it "a mysterious dealing." In his final words of comfort, Gurley invited the president to "bow in His presence with an humble and teachable spirit; only let us be still and know that He is God." Gurley's teachings on biblical providence later undergirded Lincoln's statements about God acting in the Civil War. Though praising the inscrutable intentions of God in his Second Inaugural Address, Lincoln did not retreat to agnosticism about the specific content of those divine purposes. He invoked a fiery biblical quotation: "Woe unto the world because of offences! For it must needs be that offenses come; but woe to that man by whom the offense cometh!" (Matthew 18:7). Lincoln used Scripture this time as an indictment of slavery and a formal charge against the American people. As the address built towards its final paragraph, Lincoln made an unexpected political and rhetorical move. Speaking on the eve of military victory, when many expected him to celebrate the successes of the Union, he called upon his audience to recognize evil in their midst. Instead of self-congratulation, he asked his fellow citizens for self-analysis. No president before or since has so courageously pointed to a malady that resides at the very center of the American national family. Lincoln had come to believe that where there was evil, judgment would surely follow: "until every drop of blood drawn with the lash, shall be paid by another drawn with the sword, as was said three thousand years ago, so still it must be said "the judgments of the Lord, are true and righteous altogether."" Lincoln carried to his speech the scales of justice. He did so knowing that Americans had always been uncomfortable facing up to their own malevolence. In any war, evil always seems to be relegated to the other side. "With malice toward none, with charity for all." Lincoln began his conclusion by asking his audience to enter into a new era, armed not with enmity but with forgiveness. Well aware of the feelings of both despair and hope, he asked his listeners for acts of incredible compassion. As a response to his earlier political and theological indicative, Lincoln offered an ethical imperative in the pastoral tone of a sermon: "to bind up … to care for …" He was specific about the objects of ethical duty: "him who shall have borne the battle, and for his widow, and his orphan." Portraits of widows and orphans now balanced the images of blood and swords. In a total of 701 words, Lincoln mentioned God 14 times, quoted Scripture 4 times, and invoked prayer 3 times. 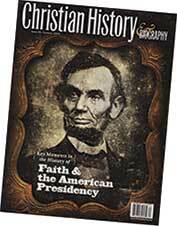 Lincoln's address provides a model for how Christians can speak of faith and politics together. First, he began by expressing respect for the positions of each side, even those whom his audience would deem the enemy. Second, he grounded his thinking in the Bible, using the Bible not simply as an illustration but as a foundation for his political arguments. Third, he affirmed that God acts in history. The "biblical providence" he heard about in the preaching of Pastor Gurley, not fatalism, was the substance of the Second Inaugural. Fourth, Lincoln was comfortable with ambiguity. He prefaced his affirmations in the "Meditation on the Divine Will" with "it is quite possible" and "I am almost ready to say." Finally, he spoke not in arrogance but in winsome humility. In the final paragraph of the Second Inaugural, Lincoln offered the ultimate surprise. Instead of rallying his supporters in the name of God to support the war, he asked his listeners, quietly, to imitate the ways of God. Neither party expected for the war the magnitude or the duration which it has already attained. Neither anticipated that the cause of the conflict might cease with or even before the conflict itself should cease. Each looked for an easier triumph, and a result less fundamental and astounding. Both read the same Bible and pray to the same God, and each invokes His aid against the other. It may seem strange that any men should dare to ask a just God’s assistance in wringing their bread from the sweat of other men’s faces, but let us judge not, that we be not judged. The prayers of both could not be answered. That of neither has been answered fully. The Almighty has His own purposes. "Woe unto the world because of offenses; for it must needs be that offenses come, but woe to that man by whom the offense cometh." If we shall suppose that American slavery is one of those offenses which, in the providence of God, must needs come, but which, having continued through His appointed time, He now wills to remove, and that He gives to both North and South this terrible war as the woe due to those by whom the offense came, shall we discern therein any departure from those divine attributes which the believers in a living God always ascribe to Him? Fondly do we hope, fervently do we pray, that this mighty scourge of war may speedily pass away. Yet, if God wills that it continue until all the wealth piled by the bondsman’s two hundred and fifty years of unrequited toil shall be sunk, and until every drop of blood drawn with the lash shall be paid by another drawn with the sword, as was said three thousand years ago, so still it must be said "the judgments of the Lord are true and righteous altogether." With malice toward none, with charity for all, with firmness in the right as God gives us to see the right, let us strive on to finish the work we are in, to bind up the nation’s wounds, to care for him who shall have borne the battle and for his widow and his orphan, to do all which may achieve and cherish a just and lasting peace among ourselves and with all nations. Ronald C. White Jr. is the author of Lincoln’s Greatest Speech: The Second Inaugural, and the forthcoming A. Lincoln: A Biography.